Skyjack’s SJ6832 RTE electrically powered rough terrain scissor marries the class leading SJ6832 RT with a powerful and efficient electric power-pack. The 6832 RTE retains the benefits of being capable of elevating 1000 lbs to 32 ft in a package that is narrower, lighter and with an overall length and turning radius of up to 20% less than the class norm. The elimination of engine maintenance requirements and fuel bills, along with the benefits of relay driven controls, the Skyjack colored & numbered wiring system and ease of service ensures that the SJ6832 RTE boasts the best possible contribution to your project’s bottom line without sacrificing performance. By coupling the proven crossover symmetrical all-wheel drive system with the remarkable torque of an efficient AC electric motor, gradeability is enhanced to an impressive 45%, providing industry leading rough terrain performance. 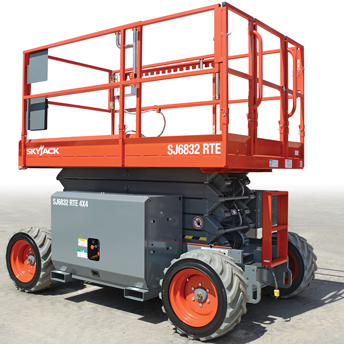 Learn more about the Skyjack model SJ6832 RTE standard features below. 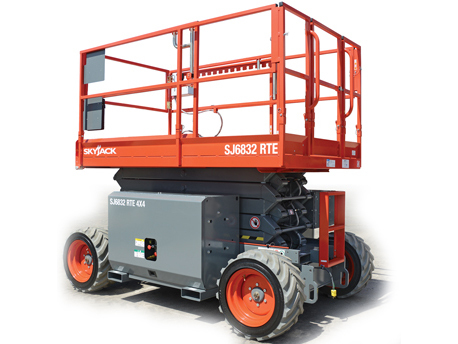 For more information about its rental prices go to our Skyjack Scissor Lift SJ6832 RTE product page or call us at (813)971-9990.